Sonya Curry is the matriarch of the Curry family that has become a basketball dynasty. You should know their story. Dell Curry is the basketball great who played for the Charlotte Hornets, and he and Sonya raised their family here, which includes sons Stephen and Seth. Stephen is currently the leading scorer in the NCAA and younger brother Seth is leading all freshman in scoring. Because Stephen has become such a big star and Davidson's games are either televised or highlights run on SportsCenter, Mom Sonya has been thrust into the spotlight as well. While watching SportsCenter just now, two things occurred to me. 1) Sports networks love to cut to shots of Sonya in the stands at Stephen's games (the family goes to a lot of Seth's Liberty games, too). 2) Sonya looks a lot like actress Thandie Newton. 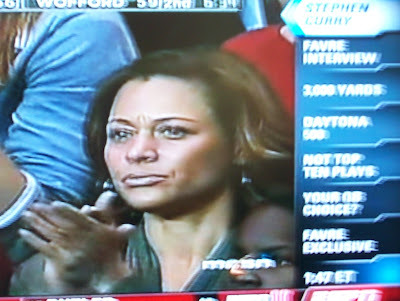 Basketball Mom Sonya Curry gets a lot of face time during games. Actress Thandie Newton could play Sonya if a movie is ever made about the Currys. Sonya Curry is undoubtedly an attractive woman. You can find her on various hot mom lists on the web and many are using that four-letter 'M' word. And while I agree, I just don't feel comfortable calling certain women MILFs. I guess it's because Mrs. Curry seems so nice.